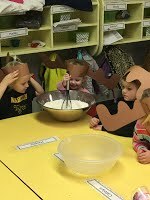 Students in Mrs. Dauber's and Sis's room work on saying the alphabet, letter identification, counting, shapes. 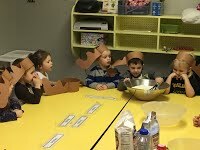 They listen to stories, have a class music time, and play at centers that foster their development. They also use apps on the iPads to help with the skills they are learning. Recess time is used for gross motor development. 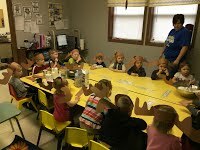 Students above are learning the letter "M" and read If You Give A Moose A Muffin and made Moose Antlers and made Blueberry Muffins.